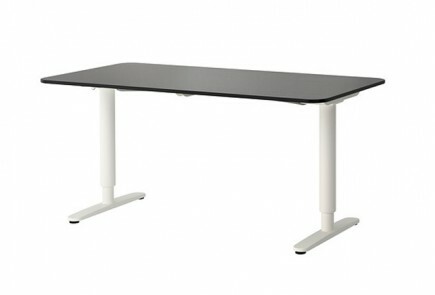 This is an exclusive private-label desk offered only through a single ergonomics products retailer, The Human Solution. The UpLift Standing Desk is built on a commodity base frame made by Jiecang of China (see our separate lab test review of the Jiecang base). A minor modification of lightweight aluminum foot distinguishes it slightly from direct competitor Jarvis Desk (from Fully). However, it reduces its stability by raising the center of gravity of the desk. The UpLift offers many desktop choices, including very cheap Chinese-made options and very pricey American-made alternatives. But all their tops are sold without warranty coverage of any kind. The standalone UpLift base gets high review marks on Amazon from DIYers (who use their own tabletops), but not nearly the number as Fully's scores. Compares favorably against other Chinese-sourced bases like Uplift, S2S and Conset. But for slightly more you can get an American-made base, if not an entirely made-in-America desk, from makers like iMovR. $630 in a standard configuration with a 30x60 HPL top and full digital controller. Human Solution offers a 7-year warranty on the UpLift base, including frame, moving parts, and electronics, but NOT including any desktops. The UpLift is a very popular mid-range option in electric standing desks. The 7-year warranty on the base frame is competitive with Fully's, which uses the same Jiecang, Chinese-made standing desk frame. Many American-made top options are offered alongside the cheaper Chinese-made options like bamboo and HPL, though very pricey. 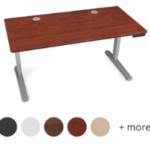 Human Solution has many unique desktop shape offerings including 120-degree, whiteboard and "pork chop", as well as three-legged versions (L-desks)—so definitely a vendor to consider if you're looking for hard-to-find tabletops variations. The Chinese-made base frame (Jiecang) and top options are of cheap quality and have significant performance issues. UpLift's 7-year warranty doesn't cover desktops - not even the $900+ vanity tops. Environmental claims about the bamboo tops are somewhat misleading. No leg extension options for taller users or treadmill desk users. In lab testing, the UpLift's Jiecang base had multiple performance issues and had difficulty matching published specifications. The UpLift is very popular, if for no other reason than Human Solution's massive advertising campaigns. Sleekly marketed and with low entry-point pricing on all-Chinese componentry, they sell a lot of UpLift desks. But the componentry is unspectacular, marketing claims are overwrought, and the warranty doesn't include the desktops. Once components are upgraded to better than bottom-end options, the pricing is not nearly as competitive as it first seems. The UpLift 900 is a mid-tier electric, stand up desk sold exclusively by Austin, TX-based ergonomic products retailer Human Solution. 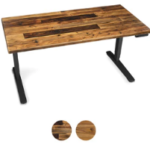 As such it is not a product sold by any other dealers; it is essentially an exclusive private label product created by Human Solution, and has become such a big part of their business that they’ve launched it out as a separate brand at upliftdesk.com. 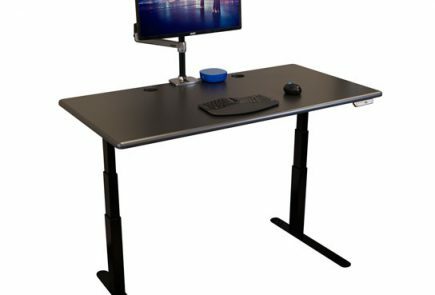 The UpLift is no doubt one of the top-selling standing desks on the market, being both competitively priced and marketed with a lot of polish. In this review we see how it stacks up to its most direct competition—namely the Jarvis desk from Fully—and how Human Solution’s marketing claims pan out. If you’re considering either of these nearly-identical desks we’d also suggest checking out their nearest competitor, also made-in-China but with a lower price and better warranty, the StandDesk Pro. Wondering how we became experts on standing desks? We’ve reviewed 25+ standing desks over the last several years and have accumulated a preponderance of knowledge in the subject area. Learn more about How we Conduct Our Reviews of Standing Desks. The most essential part of any stand up desk is the mechanical and electronic componentry that makes up the height-adjustable apparatus. The UpLift is built atop a commodity standing desk base made by Jiecang of China. See our comprehensive lab review of the Jiecang Standing Desk Frame for a much more detailed review of this base. Many standing desk sellers use the Jiecang base as their platform. It is very cheap in container quantities, and the company has been around for quite a long time mostly selling to online ergonomic retailers who, like HumanSolution, want to private label their own exclusive desk line. Each of these resellers pairs the Jiecang base with a different set of desktop options to create their own proprietary desk offerings. Most of the base frame parts are the off-the-shelf but Jiecang does require its resellers to pay for custom foot molds and to change graphics on the hand controller, since these are the two things the consumer would most readily distinguish from a photograph. The UpLift and Jarvis desks use the same Chinese Jiecang base, with minor cosmetic differences like the graphics on the hand controller and the mounting angle. The UpLift is a middling option, with cheaper alternatives like the IKEA Bekant, Autonomous SmartDesk and StandDesk Pro at the low end, and premium American-made desks like the iMovR Energize, Cascade and Lander, or the Humanscale Float Table on the higher end. It’s head-to-head competitor, however, is the Jarvis Standing Desk from Fully. Both also sell their standing desk frames standalone on Amazon for the DIY standing desk builder ($449, UpLift, Jarvis). So is there a real mechanical difference between the two sellers’ bases? Yes, and it’s all in the design of the lowly feet. 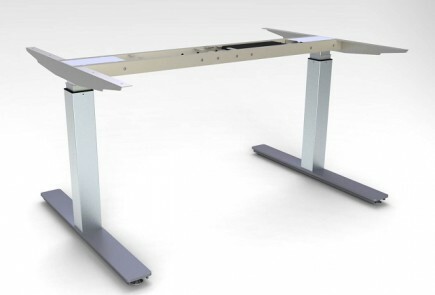 As we detailed in our lab testing of the UpLift Standing Desk Frame, Human Solution made the lightest aluminum feet we’ve ever seen on a standing desk, decreasing the entire desk’s stability for the sake of cost reduction and shipping weight (i.e. cost) reduction. Fully claims that their heavier feet lower the center of gravity of the desk and make it more stable. The base frames of the Jarvis and the UpLift standing desks are essentially the same Jiecang unit with only a slight variation in the foot design. Since both makers offer a wide array of desktop sizes and materials it’s very difficult to do a side-by-side comparison. 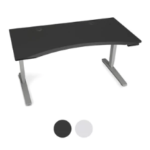 However, from an empirical physics standpoint, the UpLift’s lighter feet definitely raises the center of gravity of the desk, so it would not be the go-to choice between them if you’re thinking of a 72″ or wider desk. There is only a minor cosmetic difference between the Jarvis’ and UpLift’s digital hand controllers; both have the same cheap plastic feel and four programmable height presets. Both use the same electronics, including the cumbersome error code resets we discuss in the UpLift base lab test. UpLift claims a transit speed of 1.5″ per second whereas Fully claims 1.3″ per second; our lab test indicated a best case of 1.3″ per second on both bases, and slower and noisier under heavier loads. UpLift claims a 355 lb. lift capacity while Fully claims 350; our lab testing showed some performance issues when the desk is actually loaded that high. Like their competitor Fully, Human Solution is very big on promoting their bamboo desktops as the best choice for the environmentally-conscious consumer. These bamboo tops are the cheapest thing you can put on a Jiecang base other than their “GreenGuard” standard high-pressure laminate (HPL) tops, which UpLift sells for the same price. There’s a reason bamboo tops from China are this cheap, and it’s not because bamboo is a fast-growing crop (as both UpLift and Fully claim). The facts around the environmental scourge created by the mass farming of bamboo grass and converting it into a wood product are in shocking contrast to marketers’ claims. The urban myth surrounding bamboo’s environmental sensitivity continue to spread as these online marketers parrot each others’ claims, despite a preponderance of scientific evidence to the contrary. As you can read in our comprehensive report of Bamboo Standing Desks – Separating Fact from Fiction, if you care about the environment this is the very worst selection you can make for a desktop. It’s the same story with UpLift’s rubberwood desktops, which are identically priced and just give you a different aesthetic on the wood grain. UpLift’s other option in the entry-level price range is a traditional HPL (high-pressure laminate) desktop. This is the classic lamination on top and bottom, with color-matched edge banding all around. Human Solution again goes a bit over the top with their GreenGuard branding, which is nothing more than the current standard for virtually all HPL tabletop manufacturers under current EPA laws. Government and large enterprise customers won’t buy products that don’t meet these standards but UpLift’s marketing spin makes it sound like they’re unique in this way. As far as we can tell, their HPL tops use the same MDF core as everyone else’s, by definition made from recycled wood fibers. HPL tops have been around for decades and can be made very inexpensively just about anywhere in the world, especially in China. The disadvantage of HPL is that air and moisture will get into the open seams over time and degrade the glue to the point that the edge banding can start to peel off. Healthcare environments avoid it because those open seams can gather bacteria, and using harsh anti-septic cleaners on the desktops would only accelerate the degradation of the glues. For this reason, healthcare tends to buy hermetically-sealed and chemical-safe, 3D-laminated desktops such as Surf(x) 3D laminate. The sharp edges of HPL laminate also aren’t as nice as the ergo-contoured edges you’ll find on UpLift’s bamboo or powder-coated tops. Note that the grommet holes on an HPL top are not laminated at all, which means if you spill your drink and it seeps into the exposed MDF inside the grommet hole the wood will soak it up and expand like a puffer fish, ruining the desktop. For most people HPL is a familiar and acceptable option. Human Solution offers it in six colors and four different sizes from 48″ to 80″ wide, and 30″ deep. 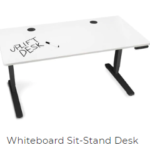 For the same price you can also get the UpLift desk with a whiteboard top (Fully charges a lot more for this option, for some reason). It’s a great idea until the first time you get marker on your sleeves, but if you want to use your desktop as a sketch pad it’s kind of a cool concept. For $20 more you can upgrade to UpLift’s “Eco Curve,” powder-coated desktop featuring a shallow curve on the user edge. Powder coating is literally the simplest and cheapest way to take a plank of MDF and make it look pretty—it is literally spray-painted on. But if you use harsh cleaning chemicals or spill Coke on it too many times the paint can literally dissolve away. We don’t recommend it due to its low durability, though it is inexpensive and will look nice for a while. On the other hand, the edging of the Eco Curve is something you can’t do with hard HPL laminates and is as close as you’ll get to real 3D lamination without using a thermofoil of some sort. For about $500 more than HPL laminate, you can select from either Douglas Fir or Teak “reclaimed hardwood” in a couple of different sizes. As we detail in our Ultimate Guide to Desktops for Standing Desks reclaimed wood can have a lot of issues with humidity and temperature changes leading to premature cracking and warping, so consider this option carefully. Starting at about $900 more and going up from there, you can spring for any of about a dozen domestic hardwood options, in a handful of available sizes. 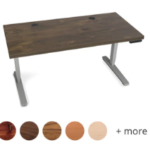 Recently UpLift introduced some lower cost albeit imported wood tops as well. 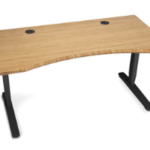 To learn all about UpLift’s (and their competitors’) real wood desktop offerings check out our comprehensive round-up of Solid Wood Standing Desk Reviews. We have to say it’s a little peculiar to think of someone spending this kind of dough to put a hardwood top on a cheap Chinese base. Seems to us that if you’re going to invest that much in a top you should buy a higher-quality American-made or Taiwanese-made DIY Standing Desk Base to lift it. Or opt for a top-quality American-made base and domestically-sourced hardwood top, e.g. the iMovR Lander Desk with Solid Wood Desktop. UpLift has come up with more desktop shape options than Fully has, with “pork chop”, 120-degree, L-desks, and other less common configurations, in their constant brinksmanship to try and outdo the other on desktop options. But for the main fare of bamboo, HPL and powder coated low-cost desktops their offerings are very similar to each other. Like FedEx vs UPS pricing, you’ll see a very slight difference here and there but their most popular configurations are priced nearly identically to each other. As the assembly process is predominantly a matter of putting the many parts of the base frame together, please see our review of the Jiecang Standing Desk Frame for details. All in all, the process is fairly standard for a base that is shipped as an “IKEA kit” of parts for the user to put together. Those who do not enjoy the DIY experience might consider hiring a professional installer, or just going with a pre-assembled standing desk. With all the concerns our expert reviewers raised above about the quality of the Jiecang base, the good news is that Human Solution has extended their warranty for a full 7 years. It is equal to their competitor Fully’s 7-year limited warranty, but not as long as other competitors such as iMovR. The real problem with both UpLift’s and Fully’s warranty coverage is that the desktops are not included. The durability of their bamboo, powder coated and HPL laminated tops leave a lot to be desired, and this is reflected in the fact that they will not warranty them against delamination or other common problems with these lower-quality surfaces. Even the costly hardwood and reclaimed wood options have no warranty coverage. As for other Chinese-made competitors, the StandDesk Pro is the only one with a better warranty, at ten years on all mechanical and electrical components, and lifetime on the steel frame. Desktops not included in their warranty, either. The UpLift is a middling offering among the many choices of electronic standing desks on the market. With its massive advertising campaigns and sleek marketing presentation, it has become one of the most popular standing desks sold today. Its pricing, while competitive on the surface, is higher than other Chinese-made alternatives, and not so much cheaper than better-constructed, made-in-USA alternatives as to be truly competitive. While you can opt for American-made vanity tops to pair with your UpLift base, they are even pricier than the desk itself. While we have concerns about the UpLift’s performance claims and lack of a desktop warranty, we can say that if you’re considering other Chinese-made products, it’s probably worth paying a little more for easier domestic customer service versus what you might experience with something like the Autonomous or Bekant. Also see our detailed reviews of UpLift’s three L-shaped desks. Independently verified UpLift Standing Desk user reviews can be found on Amazon. I have one and it is great. It was actually pretty easy to install. I made my own custom top out of a 6 ft slab of butcher block that I bought at Lowe’s and finished my self. I was very picky on choosing an adjustable frame for my work bench as I am a watchmaker and I need something sturdy that would support a fair amount of weight such my tools, a computer and monitor, and me resting my arms on it for extended periods of time. I have had it for over a year now and it is still working perfectly. Don’t buy one. Yes, it works well but the desktops stain and etch if you spill anything on them. I have a very clean office but mistakes happen and a couple of times I’ve spilled a bit of a drink which left stains. I asked the company what can be done, what cleaners they recommend, etc. and they said there’s nothing that can be done. If you drop a bit of coffee on your desk it shouldn’t be permanent. Big thumbs down. I have installed over 10 of these units and so far everyone is happy with them. 3 years and no problems at all.